Am I? Am I really in control? Do I want to be? And for it to be in control, shall I move to Ghana? I have asked myself these questions too often the past year. “It is no easy” as my Ghanaians friends love to describe their daily challenges, often followed by confirming sighs of drama and jokes. Northern Ghana is rough. Education is expensive, finding jobs is difficult and are not ‘naturally’ there. The weather interchanges the hot dry season with heavy rains that have it’s effect on a stable power supply. It is dusty. It is poor. And the food, let’s not go there. But the people, these youngsters, only a few years younger than I am, being efficiently hold back by their own government to have opportunities. Prospect. A way out. A safer future. It is simply not there or only within reach for a lucky few. If you have seen it, experienced it, felt it, it is difficult to walk away from, especially if you got to know them personally. The guys I work with are wonderful. And they are right. Things are far from smooth. Living in the northern part of Ghana is no easy, in fact. Ever since we shot the video this sentence echoes in my head. Like Boris tries to shake off his ‘keep the soul alive’ Idols performance for the past 10 years we seriously have to prevent eternal association with the beautiful but rather scare achievement. But yeah, fair enough, in June 2013, Tech Support was just an idea, nothing serious. Let’s meet, bring a projector and we start building websites with real assignments as the entry point. The community grew. Twelve members. Fifteen. Twenty. Thirty. And then we made these websites for Presby Education Unit, GIGDEV and Word Aids Day in Tamale. We were so proud off it. And we continued. Building personal websites and a website for Tech Support. My partner in crime and myself hide for a several days before Christmas to draft a plan for 2014; promote vocational training and execute assignments. Just before the closure of 2013 we won the development of a school management system, a large project given to us by the International Institute for Communication and Development (IICD). Tech Support was only 6 months old. The past year, the guys performed wonderfully. They ran several WordPress, Joomla!, HTML, CSS, PHP, documentation, photo editing and video editing courses and initiated ‘Take the Stage’ (an event whereby all members presented their ideas and had the opportunity to realise them) and two Open Source Days whereby speakers from Accra were present to enlight us on ‘the open movement’. Together with IICD and Savana Signatures, Tech Support started with the development of the School Management System and deployed the system in 4 pilot schools in the Northern region in Ghana. Looking back, I dare to state that this project has caused tremendous personal growth among the members of Tech Support that is reflected in a more confident attitude, presentation skills and customer contact. In addition to the growth in personal skills, the members certainly made a professional growth in the areas of software development, training, documentation, prototyping and cooperation, as well. And they earned money. Not a lot, but a fair amount to compensate for the work done. The Road trip of course. Pushing all members out of their comfort zone and meet technology partners in the country. We drove 1200 kilometres of which 75% without a spare tire (sorry mum), in four days to meet Voto Mobile in Kumasi, zooming in on mobile technology and to talk about social entrepreneurship with inspiring entrepreneurs at Hub Accra. An all this with our new friends: Richard, Richmond and Hilary representing other cities in the northern part of the country. The ongoing development of the school management system and implementing the software in 21 schools. Yes, the contract has been extended to 2015 and Tech Support will work together with Butterfly Works and BIBIR-Ghana to set up the seventh BITS Digital Design school, the first in West Africa! We have been asked by Accra to participate in a technology challenge, we have met the Linux Group, we have plans to organise a new Road Trip through Ghana, we are developing websites for new clients, and more leads are coming our way but this could not have been done if it wasn’t for the members. I remember Issah who joined quietly from the onset and now runs the WordPress tracks as if he invented WordPress and he has played a key role in the development of the school management system. Matthew, even more quiet, presenting himself as a parasite of Issah since he had no laptop and managed to build his website from an internet café including the import and export of databases. He joins Issah in facilitating the WordPress tracks. Muhsin who wanted to build a website for a school and who is now training teachers on how to manage their student information for better management purposes. Leonard, who I met in a car travelling to a project site in 2013 to check on ICT centres at various health facilities. He is now is the director (and all of a sudden a true leader) of Tech Support and works on a health management system. Emmanuel who created our Facebook page including 200 likes in 3 days. He moved to Accra and became a web developer through the knowledge he gained at Tech Support but he came back to contribute even more and is now communications officer. To Solomon who has always been present and a secure ride home while we would both dream about the future of Tech Support. He is the general secretary of the group. To Fauzia, in charge of the finance department and our first lady who managed to stay for longer than 3 months. To Robertson, an invisible strength with great programming skills and a smile you can’t ignore. Vitus who is proud to be have participated in one of the first meetings and who is patiently waiting for a Tech Support Group in his city where he can play a serious role together with Francis and Henry (if they have not started already). To Napps, printing t-shirts and stickers proudly worn by the members. To Timothy who kept track of all members joining in what has given us an e-mail list of 200 members and an excel we are still benefiting from today. And to Fred. Fred. Our beloved system administrator managing the What’s App group with over 100 members, always sharing his hyper intelligent analysis on partnerships and technology. And to Ken, I can not even imagine where to start to express my appreciation for Ken. Partner in crime. After all this, I do wonder how I relate to the above. If what I see is really there and how we shall continue in the future. The past three months were meant to reflect on my role in and control over my own life and happiness. I simply can not walk away and I have decided to remain involved while being based in the Netherlands. I am confident we came up with the best structure ever, what gives me the desired overview and control. Three months in northern Ghana will certainly have it’s impact on me but this time I can look back at this adventure from my own rooftop in Haarlem. So, Techama. Let’s go. Let’s go home. Great Kim! 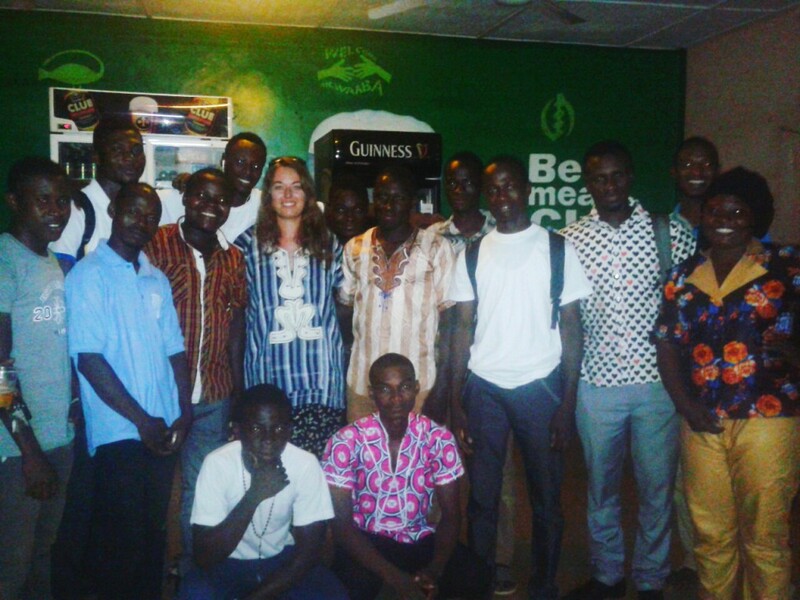 That was a nice experience and development to and from TechSupport Ghana, Hope to receive you soon again!.